I was on board to a Garuda Indonesia flight from Haneda Airport. I was spending my last day at office which I am actually employed to. I was going to be unemployed at the end of June and I had a right to utilize my “paid holiday” which never had a chance to be spared during the past 3 years. I chose Timor-leste( East Timor) and Indonesia as my destination. So today, I would like to tell you what I have seen in Timor-leste. we are related so much to this island. Timor-leste is said to be the 1st country which has won its independence after the commemoration of 21 century. It has been independent from Indonesia at 2002. 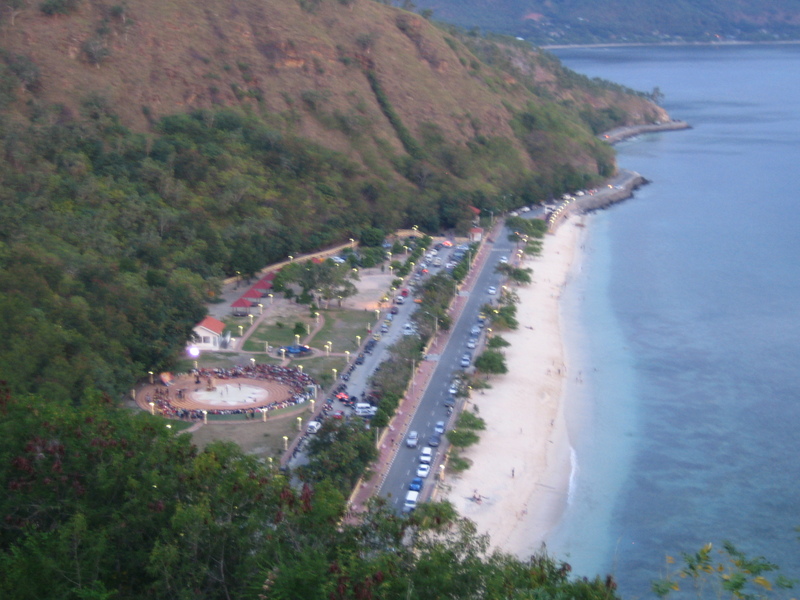 It is located at east side of the Timor island and the west side of the island belongs to Indonesia. Its land has approx. 15,000㎢ and the population is 1 million. 99% is said to be Catholics and this is due to the colonization of the Portuguese. In total the flight will take about 8 hours long from Tokyo to Timor-leste, transferring at Denpasar (Bali). This time, I’ve asked my Timorese friend to host my trip there. We’ve known each other when we were both studying in Portugal. There was no such big reason that I chose this island as a destination. I saw a beautiful picture of Timor-leste and soon be interested in and I was lucky enough to have a friend who is actually living in this country. At first, I had an impression that this country might be a kind of dangerous place (I am sorry, my friend!) so I made some small researches before I start my trip. Then I was surprised to know the negative relationships between Japan and Timor-leste. During the WW2, Japan was dominating this island. How many Japanese young people know this fact? The island is also located close to Australia so there were some fights for the Australians and Japanese involving lots of locals. After the WW2, Timor-leste was continuing dominated by Portugal and Indonesia. supporting the resisting power to the independence of Timor-leste. Japan was indirectly but attaching Timor-leste. After learning all this history, I found why colleagues from Timor-leste knew lots of Japan. And soon I became so embarrassed of not knowing anything of our own country’s history. In actual Japanese educational curriculum, WW2 is described as Japan is a victim rather than a perpetrator. I want to say clearly here that i think Japan is a perpetrator to many asian people not referring only to this episode but including others, during this period. I’ve also watched this movie in ahead to this trip. Now, let’s start the report. The following 6 points are what I would like to tell you all. landing at Dili Airport was very different. I didn’t see any sight of the land but only the ocean but the hight was going down and down. I thought, “oh no, oh no! The aircraft will just jump in to the water!”. However, we’ve landed safely. lol. It seemed that this happened because the runway leads to the sea directly. I’ve seen lots of animals sold or not on the street. my friend told me that they are pigs. When we were driving, I saw lots of pigs laying down on the street. I have never seen a scene like this before. I asked my friend and she said, “No they are alive” laughing at me. I regret that I didn’t take a picture. Dogs were around everywhere, too no matter strayed or not. I was scared of being bit by them (to tell the truth, I am not good at animals). I felt as if the time has stopped. I thought China is the only country where eats dogs. 3. Noise? What is that? Many Timor-leste people like music and I was surprised when a neighbor was playing music from their stereo with a big volume. This was not the only case and I heard musics in many locations. If this was in Japan, it won’t take time to be yelled at or someone will come to their home and ask them to lower the volume. Usually, I don’t like noisy music but this time, the music didn’t bother me at all. I was already used to it. My friend was living in a very cozy, neat home. When I used her bath room, it was the type I’ve never seen before. next to the built-in bath tub. On the floor there was a water drain and the shower head was put on the wall. There was a small accident after I flushed the toilet. The water suddenly came out from the shower head, automatically! I was surprised and half screamed my friend’s name. She was laughing seeing I was in a little panic. She put the shower head in the “bath tub” which was not a bath tub but a place to keep water. Another interesting story was every toilet in Timor-leste has a small shower with it! I learned that there was no customs of using toilet paper in the past from my friend. Another story related with the bath room is about shower. Since Timor-leste is a tropical country, they take a shower with a cold water. However the water is not that cold so you won’t be freezing by its temperature. My friend mixed the hot boiled water and the natural water for me in a tub for her baby. I utilized the hot water preciously soaking my feet or washing my body. It didn’t take half an hour to finish my bath. I became fresh and very satisfied. I wondered how much water I was using when I was taking bath in Japan. I always put some hot water in the bath tub and it was not rare to take bath more than an hour. My friend who is a mother of a 6 months old baby, told me an interesting story. There is a lesson that Mothers in Timor-leste have to take bath with a very hot water until their baby become 1-year-old. 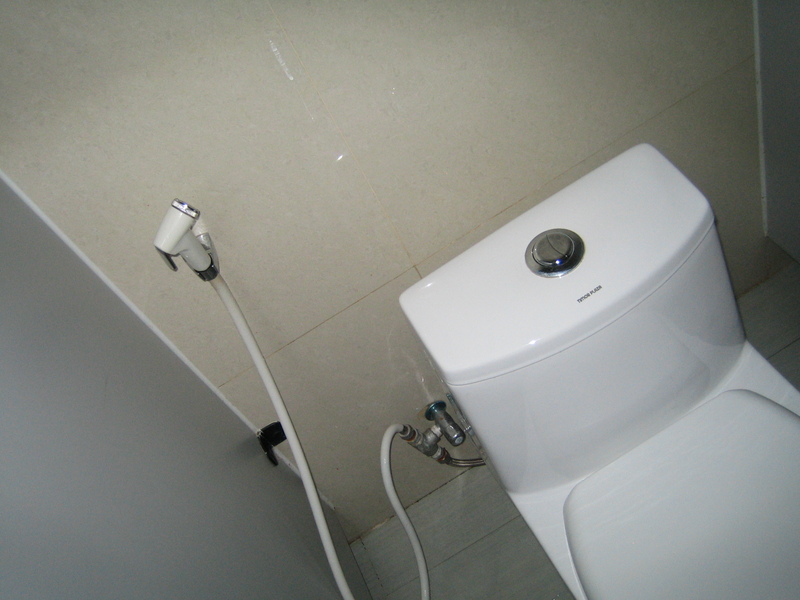 My friend was used to this very very hot water but I thought it is impossible for me. You can enjoy the real nature. The country is not “touristic” place yet and I hope it will not install anything like an artificial attractions for tourists from now on. 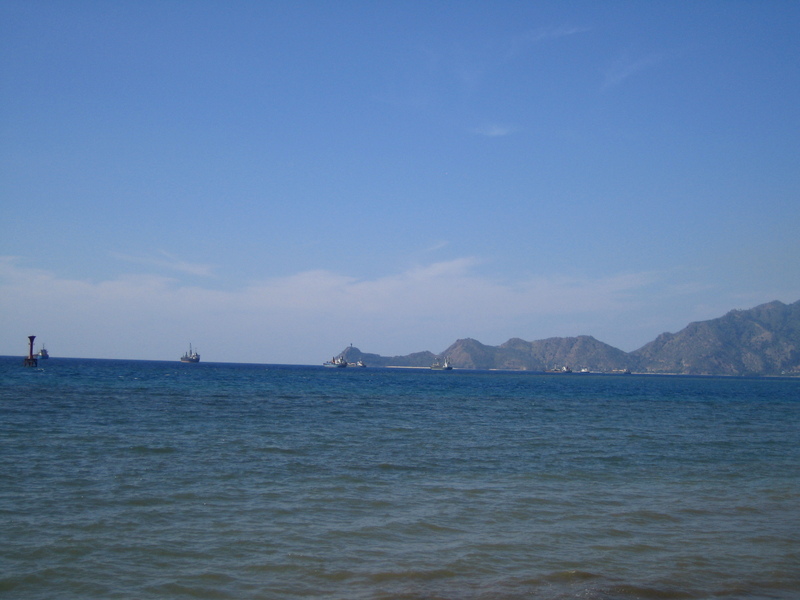 I was staying at the capital, Dili this time and the beautiful point was the Dili gulf/ harbor. Dili’s main street in running parallel with the sea so it is like watching a beautiful picture of the sea all the way from the car. There is a hight on the east and west end. On the east, there is a “Christo Rei (Statue of the Christ)” on the top and you have to climb many steps till there. It is not steep but you will sweat. Pregnant lady do climb this steps in order to gain power for their delivery and so did my friend but I thought this exercise is way too much for mothers with big belly. What will you do if she got her sign during the exercise? isn’ t there any word except “beautiful”? People are just kind and warm. Even to a tourist like me. My friend brought me to her office which was a governmental institute. I entered to her office without any security check. Her colleagues welcomed me and her baby. I thought Japan needs this kind of “open mind”. It won’t affect that much even you have a guest or a baby for a while. In Japan, bringing one’s child to one’s working place is hardly seen. If so, only on weekends. These are what I have captured in Dili, Timor-leste. Lots of places are yes, under developing now but there are no dark or cold atmosphere. May be this is due to the people’s warmth, bright smiles and the strong relationships. I shall not describe that the country has an idyllic air. Time just goes by with the wind. Next time, I have to go to the other islands of Timor-leste. The country made me feel that “I have to go back there and discover more!”. 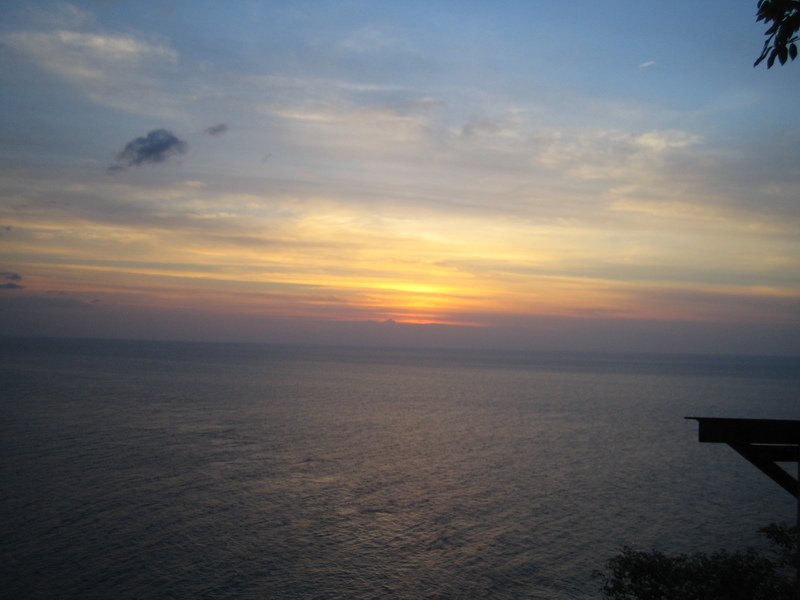 How about choosing Timor-leste for your next destination?